The Dolphin Encounter is a tour designed for kids of all ages – and that includes adults! 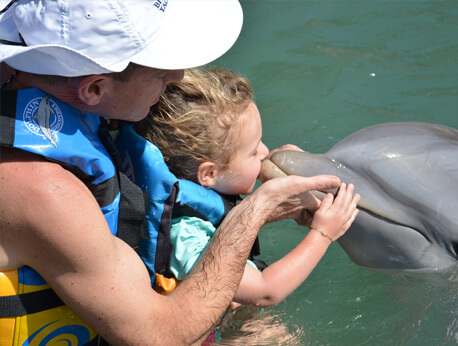 It provides each participant the opportunity to kiss, hug, and shake hands with dolphins. You will enjoy the dolphins as they play and frolic in their own natural habitat, as this is an experience that simply cannot be replicated in many places on earth. It will be a trip that you’ll remember for years to come. If you are anywhere in the Dominican Republic, then you really cannot miss out on the Dolphin Encounter in Punta Cana. There truly is nothing like this excursion. Many of us grew up watching dolphins from afar on either television or in the movies. We have heard how friendly and smart the creatures are, but never did we envision that we would actually come into physical contact with one. Now, that is most definitely possible right in the pristine waters of the Dominican Republic! Your trip will begin with a quick ride over to Punta Cana. It will not take long, and the scenery along the way is simply breathtaking. Once you are there, the fun-filled adventure will begin. The dolphins are at home in their natural habitat. As marine oriented tours are meant to be educational, you and your family will learn a great deal about the smartest of marine animals. During this time, you will likely see the dolphins playing with one another, waving at you with their fins, and otherwise waiting patiently for you to come play with them. Yes, there will be time for you to actually play with the dolphins! How cool is that? You will be able to swim, hug, kiss, and enjoy their company. You’ll also be shown some training techniques and get the chance to put them into action when participating in the hand targeting portion of the encounter. The hand targeting activity includes using hand-signals to communicate to the dolphin to touch their snout to your hand. This is truly the experience of a lifetime, so a resident professional photographer will take plenty of photos. Those will be available for purchase at the conclusion of the program, so you can spend your time just being amazed by these fabulous animals. Not only will the dolphins offer to shake hands with you, they will show you their natural habitat. Dolphin Encounter is meant to promote ecological awareness, and you will see this on display all around you. Working to preserve natural habitats such as this one found in Punta Cana will help ensure that marine animals survive. Remember to only wear biodegradable sunscreen and to take any waste that you accumulate during your tour. At the end, enjoy a drink and meal at the restaurant and just bask in the beauty of nature. Kids are 3'3" to 4'6" and adults are 4'7" and above. 1 to 7 year olds must swim with a paid adult. 8+ year olds can swim on their own. In Punta Cana groups have a maximum of 15 people for a closer experience. Additional charge of $20 USD per companions.